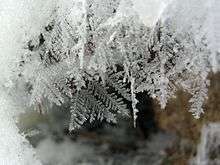 This article is about ice crystals which form snow. For the bulbous spring flower, see Leucojum. For other uses, see Snowflake (disambiguation) and Snowflakes (disambiguation). Naturally formed snowflakes differ from one another through happenstance of formation. 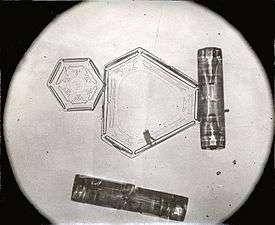 Wilson Bentley micrograph showing two classes of snowflake, plate and column. Missing is an example of a needle. 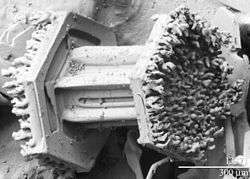 Scanning electron microscope image of rime frost on both ends of a "capped column" snowflake. In warmer clouds an aerosol particle or "ice nucleus" must be present in (or in contact with) the droplet to act as a nucleus. 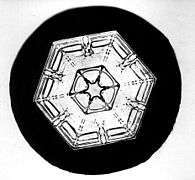 The particles that make ice nuclei are very rare compared to nuclei upon which liquid cloud droplets form; however, it is not understood what makes them efficient. Clays, desert dust and biological particles may be effective, although to what extent is unclear. Artificial nuclei include particles of silver iodide and dry ice, and these are used to stimulate precipitation in cloud seeding. Experiments show that "homogeneous" nucleation of cloud droplets only occurs at temperatures lower than −35 °C (−31 °F). Once a droplet has frozen, it grows in the supersaturated environment, which is one where air is saturated with respect to ice when the temperature is below the freezing point. The droplet then grows by deposition of water molecules in the air (vapor) onto the ice crystal surface where they are collected. Because water droplets are so much more numerous than the ice crystals due to their sheer abundance, the crystals are able to grow to hundreds of micrometers or millimeters in size at the expense of the water droplets. This process is known as the Wegener–Bergeron–Findeisen process. The corresponding depletion of water vapor causes the droplets to evaporate, meaning that the ice crystals grow at the droplets' expense. These large crystals are an efficient source of precipitation, since they fall through the atmosphere due to their mass, and may collide and stick together in clusters, or aggregates. These aggregates are usually the type of ice particle that falls to the ground. 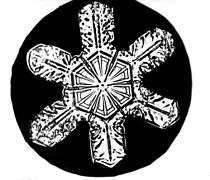 Guinness World Records list the world's largest (aggregate) snowflakes as those of January 1887 at Fort Keogh, Montana; allegedly one measured 15 inches (38 cm) wide. Although this report by a farmer is doubtful, aggregates of three or four inches width have been observed. Single crystals the size of a dime (17.91 mm in diameter) have been observed. Snowflakes encapsulated in rime form balls known as graupel. The exact details of the sticking mechanism remain controversial. Possibilities include mechanical interlocking, sintering, electrostatic attraction as well as the existence of a "sticky" liquid-like layer on the crystal surface. 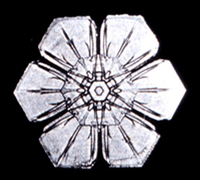 The individual ice crystals often have hexagonal symmetry. Although the ice is clear, scattering of light by the crystal facets and hollows/imperfections mean that the crystals often appear white in color due to diffuse reflection of the whole spectrum of light by the small ice particles. 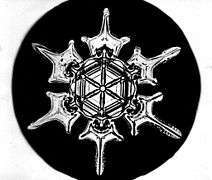 The shape of the snowflake is determined broadly by the temperature and humidity at which it is formed. Rarely, at a temperature of around −2 °C (28 °F), snowflakes can form in threefold symmetry — triangular snowflakes. The most common snow particles are visibly irregular, although near-perfect snowflakes may be more common in pictures because they are more visually appealing. 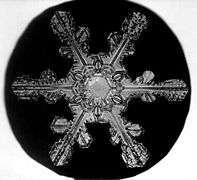 It is unlikely that any two snowflakes are alike due to the estimated 1019 (10 quintillion) water molecules which make up a typical snowflake, which grow at different rates and in different patterns depending on the changing temperature and humidity within the atmosphere that the snowflake falls through on its way to the ground. A non-aggregated snowflake often exhibits six-fold radial symmetry. 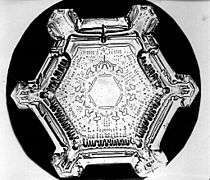 The initial symmetry can occur because the crystalline structure of ice is six-fold. The six "arms" of the snowflake, or dendrites, then grow independently, and each side of each arm grows independently. 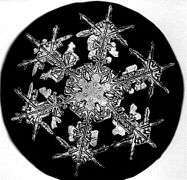 Most snowflakes are not completely symmetric. 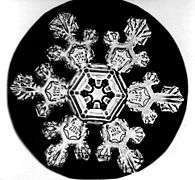 The micro-environment in which the snowflake grows changes dynamically as the snowflake falls through the cloud, and tiny changes in temperature and humidity affect the way in which water molecules attach to the snowflake. Since the micro-environment (and its changes) are very nearly identical around the snowflake, each arm can grow in nearly the same way. However, being in the same micro-environment does not guarantee that each arm grow the same; indeed, for some crystal forms it does not because the underlying crystal growth mechanism also affects how fast each surface region of a crystal grows. Empirical studies suggest less than 0.1% of snowflakes exhibit the ideal six-fold symmetric shape. Snowflakes form in a wide variety of intricate shapes, leading to the notion that "no two are alike". Although nearly-identical snowflakes can exist, they are very unlikely to be found in nature. 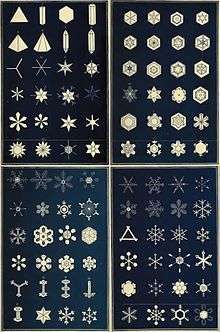 Initial attempts to find identical snowflakes by photographing thousands of them with a microscope from 1885 onward by Wilson Alwyn Bentley found the wide variety of snowflakes we know about today. 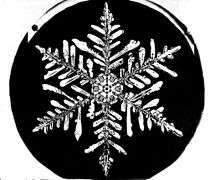 The shape of a snowflake is determined primarily by the temperature and humidity at which it is formed. The most common snow particles are visibly irregular. Freezing air down to −3 °C (27 °F) promotes planar crystals (thin and flat). In colder air down to −8 °C (18 °F), the crystals form as needles, hollow columns, prisms or needles. In air as cold as −22 °C (−8 °F), shapes become plate-like again, often with branched or dendritic features. At temperatures below −22 °C (−8 °F), the crystals becomes plate-like or columnar, depending on the degree of saturation. As Nakaya discovered, shape is also a function of whether the prevalent moisture is above or below saturation. Forms below the saturation line trend more towards solid and compact. Crystals formed in supersaturated air trend more towards lacy, delicate and ornate. Many more complex growth patterns also form such as side-planes, bullet-rosettes and also planar types depending on the conditions and ice nuclei. If a crystal has started forming in a column growth regime, at around −5 °C (23 °F), and then falls into the warmer plate-like regime, then plate or dendritic crystals sprout at the end of the column, producing so called "capped columns". They documented each with micrographs. The International Classification for Seasonal Snow on the Ground describes snow crystal classification, once it is deposited on the ground, that include grain shape and grain size. The system also characterizes the snowpack, as the individual crystals metamorphize and coalesce. The snowflake is often a traditional seasonal image or motif used around the Christmas period, especially in Europe, the United States and Canada. It represents the traditional White Christmas. During this period, it is quite popular to make paper snowflakes by folding a piece of paper several times, cutting out a pattern with scissors and then unfolding it. Snowflakes are also often used as symbols representing winter or cold conditions. For example, snow tires which enhance traction during harsh winter driving conditions are labelled with a snowflake on the mountain symbol. A stylized snowflake has been part of the emblem of the 1968 Winter Olympics, 1972 Winter Olympics, 1988 Winter Olympics, 1998 Winter Olympics and 2002 Winter Olympics. In heraldry, the snowflake is a stylized charge, often used to represent winter or winter sports. Three different snowflake symbols are encoded in Unicode: "snowflake" at U+2744 (❄); "tight trifoliate snowflake" at U+2745 (❅); and "heavy chevron snowflake" at U+2746 (❆). 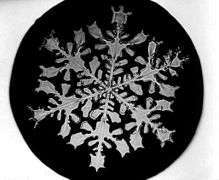 Koch snowflake - mathematical curve resembling a snowflake. Sekka Zusetsu - Figure collection of snowflake written in Japan in the 19th century. 1 2 Broad, William J. (2007-03-20). "Giant Snowflakes as Big as Frisbees? Could Be". The New York Times. Retrieved 2009-07-12. 1 2 Lawson, Jennifer E. (2001). "Chapter 5: The Colors of Light". Hands-on Science: Light, Physical Science (matter). Portage & Main Press. p. 39. ISBN 978-1-894110-63-1. Retrieved 2009-06-28. ↑ Christner, Brent Q.; Morris, Cindy E.; Foreman, Christine M.; Cai, Rongman & Sands, David C. (2007). "Ubiquity of Biological Ice Nucleators in Snowfall". Science. 319 (5867): 1214. Bibcode:2008Sci...319.1214C. doi:10.1126/science.1149757. PMID 18309078. ↑ "Meteorology Glossary: Cloud seeding". American Meteorological Society. 26 January 2012. Retrieved 2016-01-05. ↑ Basil John Mason (1971). Physics of Clouds. Clarendon. ISBN 0-19-851603-7. 1 2 3 4 M. Klesius (2007). "The Mystery of Snowflakes". National Geographic. 211 (1): 20. ISSN 0027-9358. ↑ Libbrecht, Kenneth G. (2006-09-11). "Guide to Snowflakes". California Institute of Technology. Retrieved 2009-06-28. 1 2 John Roach (2007-02-13). ""No Two Snowflakes the Same" Likely True, Research Reveals". National Geographic News. Retrieved 2009-07-14. ↑ Libbrecht, Kenneth (Winter 2004–2005). "Snowflake Science" (PDF). American Educator. Retrieved 2010-10-19. ↑ Nelson, Jon (15 March 2011). "The Six-fold Nature of Snow". The Story of Snow. ↑ Nelson, Jon (17 March 2005). "Branch Growth and Sidebranching in Snow Crystals" (PDF). Story of Snow. ↑ Bohannon, John (10 April 2013). "ScienceShot: The True Shape of Snowflakes". ScienceNOW. American Association for the Advancement of Science. Retrieved 5 January 2016. ↑ Warren, Israel Perkins (1863). Snowflakes: a chapter from the book of nature. Boston: American Tract Society. p. 164. Retrieved 2016-11-25. ↑ Jon Nelson (2008-09-26). "Origin of diversity in falling snow" (PDF). Atmospheric Chemistry and Physics. Retrieved 2011-08-30. ↑ Libbrecht, Kenneth (Winter 2004–2005). "Snowflake Science" (PDF). American Educator. Retrieved 2009-07-14. ↑ Matthew Bailey; John Hallett (2004). "Growth rates and habits of ice crystals between −20 and −70C". Journal of the Atmospheric Sciences. 61 (5): 514–544. Bibcode:2004JAtS...61..514B. doi:10.1175/1520-0469(2004)061<0514:GRAHOI>2.0.CO;2. ↑ Kenneth G. Libbrecht (2006-10-23). "A Snowflake Primer". California Institute of Technology. Retrieved 2009-06-28. ↑ Kenneth G. Libbrecht (January–February 2007). 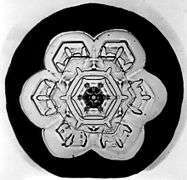 "The Formation of Snow Crystals". American Scientist. 95 (1): 52–59. doi:10.1511/2007.63.52. ↑ Gilles, Tim (2004). Automotive chassis. Cengage Learning. p. 271. ISBN 978-1-4018-5630-4. Retrieved 2009-07-15. ↑ "More About Sapporo 1972: The Emblem". International Olympic Committee. Retrieved 2016-01-05. ↑ "Olympic Games Salt Lake City 2002 - The emblem". International Olympic Committee. 2009. Retrieved 2009-07-15. Kenneth G. Libbrecht (2006). Ken Libbrecht's Field Guide to Snowflakes. Voyageur Press. ISBN 0-7603-2645-2. Wikimedia Commons has media related to Snowflake.